Find your way 'home.' The distance counter tells you how far you are from home. A game about journeying back home. Taking artistic inspiration from indigenous colours and masks. Started with our character modeling. This is our robot toy character! Very cool!!! super cute!!! you should get actions figures made of this! @BenCrooks Thanks! We're going for a more voxel/toy feel. @KleinM Thank you! We're definitely going to look into some 3D printing now! Looks gorgeous, looking forward to more on your gameplay ideas! This is so awesome. Great stuff. Love the style! It is very compelling. Note: There's a web version but the sound quality is better on the downloadable version (for windows). Gave it a go and found myself captivated rather quickly by the sound and rhythmic side of the game. The only thing I feel takes away from the experience a bit is the camera rotating around the character as opposed to the character following the rotation of the camera - unless I'm doing something wrong. It just made it a little difficult to keep track of where I was going. Aside from that, great job on the game, guys! It looks and plays really well! @FlyinGerbiL thanks for playing! Yeah I definitely get where you're coming from. We wanted to subtly show where the destination is by having the character's head turn towards it during gameplay and as a bonus we got to show the turnaround of the full head. For future development we could definitely change it but we can't think of a quick fix for the submission at 6 because when we remove it, it doesn't look as good. We think maybe a more complex camera controller would help? @RaoulMarz Thanks so much for playing! Glad you liked it! I completely get the lack of time for the more complex mechanical implementations. Maybe add an optional way of moving with the arrow keys or wasd as well? That way you can keep the camera controller the same, just remove the movement from it, and do it through a sort of 3rd person controller? Then one can still rotate around the character to look at the beautiful visuals, but have slightly more control over the camera? @FlyinGerbiL using the arrow keys could solve the issue! We will definitely try this and see which works best! Thanks again! I really love the look of the game! The colours and the designs are distinctive and feels really interesting. - The initial entry into the game is quite confusing due to a few design decisions that I couldn't really understand. - The "forward axis" is locked 45 degrees left? That meant if I wanted to move towards something, I have to keep it in the "corner of my eye", so to speak? - The turning only worked when you were moving forward, so you can't look around before you decided to move forward? - The head turning the opposite direction of the mouse movement, combined with the weird angle of direction, made it difficult to understand what was going on initially. For us it's probably fine, for a broader audience they would probably assume it's buggy. - Though also I didn't feel like I had much control or say in the building of the character - especially when I discovered that it appears you can't pick up the same piece twice? The pieces are pretty much indistinguishable from one another at a distance, so spending the time to walk up to a thing to discover that you can't pick it up felt disappointing. - Overall I still didn't quite understand what the game was aiming for, the name is "Distance" and there's a distance gauge, and it was only after a while that I realised that it wasn't counting up or down (I first thought it was counting up, then down) and that it was the distance away from home. Then I thought you were supposed to collect everything and go home, then I realised when the fuel ran out you ended up back home, so maybe you're supposed to try for a "high score" of distance, but then the game doesn't really do anything that indicated that (like a "highest distance" somewhere somewhen would have did the trick). - You should be able to lock the mouse inside the game so that it doesn't drift outside the window, that causes buggy behaviours. @Tuism thanks for playing and for the extensive feedback. We actually forgot to change the camera angle back after changing it a few times, thanks for the reminder. Initially you were able to turn while being stationary and it wouldn't take up fuel but we wanted to use one button for turning and movement because that felt more natural. For the purpose of understanding the game: you're meant to find your way to 'home' and the distance counter tells you how far you are from home. So the further you get from home the higher the amount of distance and the closer you are to home, the lower the distance counter. Also the head is always looking at home. It is to show you which direction the player should go, but not telling them explicitly. We wanted the player to figure out these subtle hints for themselves, but it didn't come across as effectively as we would have hoped. You can have two of the same objects. The only limitation is that you can only hold 4 objects at a time. When you go to collect the 5th object it will be added to you at the bottom of the stack and the top object is removed. For the right click, we wanted players to be able to 'control' where they ran out of fuel because their "graves" (of where they had no fuel) spawn more resources. So even though you are pulled back to start when you run out of fuel, it becomes easier to go further each time. If we had more time we would have definitely put more into visual communication and we thought that the information we were giving would be enough but we definitely see where you're coming from. We wanted to make a game where the player had to explore to find the objective, instead I think we may have missed some points in communicating some information to the player. Hellllooo, really love the art direction and concept of the game. The little footsteps that you leave behind are really cool. It is a bit confusing as what you should be doing in the game. I could never make it more than 400 distance away from the target? Anyways love the way it looks and feels! Heyo guys, great job on getting such a cool and beautiful + soothing game out! - Camera was too zoomed in? Felt a bit frustating to see things. - You get used to the controls, but I think they're still a bit clumsy and hard to move. - I like the idea of the little things you pick up giving you a mix of fuel and speed. But there isn't always an interesting choice here because you always need fuel, so you'll pretty much always take the pick up to get fuel? - Additonally, it's a bit hard to see how speed relates to fuel consumption, but it seems like it's based on time? So the faster you move, the less fuel you consume? That adds a bit of information to helping players decide things, but the controls' awkwardness make it hard to act on. - Some sort of way to see the speed of the elements on your totem would be useful! because you don't know if you're picking up a better or worse element. - Might be nice if you could choose which head on the totem to swap out too! - I never got to the ending because it was too hard with the controls, but could see it was an interesting system! Great job, guys! This is a cool little game that just needs some tweaking! @DrJerryMovich Thanks for playing! I'm not sure why you cant get further, have you played through it more than once and tried to get closer? @Bensonance Thanks for the great feedback! All valid points. We definitely didn't even think of showing the speed values on collected heads. We don't make a lot of 3D games so this was a bit of an experiment for us. We definitely focused on setting a scene and creating a mood but let some important parts of gameplay down a bit. That being said, this isn't a game we would take further but what we learned from making it and the feedback we received is super valuable. Dope. I really should've read the instructions before playing. I was very confused on what my objective was at first. Then I noticed the distance getting shorter in certain directions. So, that was me figuring out where home was before I knew I was trying to get home. Music, FRESH. Do you add more layers as you collect the heads? It almost felt like that when I was playing. Controls were weird but been mentioned extensively above. Nicely done. I like the feel and atmosphere. I wasn't too bummed by my confusion because everything else led me to play longer trying to figure it out and that was cool in itself. Hi guys. Really cool experience - love the sound and graphics, well done! The music changing is unexpected and I kept wanting to pick up more stuff just for that. The game really does transport you to the world of the character. My game was cut short when the dude flipped upside down and I couldn't get him right-side-up again, but this is a game that I will be coming back to once I've played through the other jam games. @SUGBOERIE Thanks for playing! Yeah you add different sounds when you collect different heads. I'm glad you see what we were going for! @jamotaylor Thanks so much! I'm not sure why the character flipped over, sorry about that. I am glad you're willing to give it another try! Cool! Art direction is funky, it's definitely got some punch to it, color choices are great nice one. I got frustrated quite quickly with the game play, I thought my mouse was acting up haha. Character movement / camera relationship was really quite awkward, felt like I was fighting the camera to try play the game, don't think that's a design decision that helps the experience play out a certain way. Didn't link your description in the comments of how it's supposed to play to my experience, I was just getting fuel boxes because I had a fuel bar, but it kept going down, so didn't make a link that I could only carry 4. I think the music track was quite hypnotic and sometimes it was in sync with the dropping of the polaroid snapshots which was awesome, but less awesome when it went out of sync. I wanted to make some other choices besides collect fuel to collect fuel thing, so it got tedious/boring quite quickly. Otherwise a pretty neat jam game that looks great. I'm not too sure what is going on in this game. The music is cool, but it gets a bit repetitive. I like that more sounds come in when you pick up more houses. Interesting game, I think the art was definitely the strongest element, but the music building mechanic was also pretty cool. Echoing others before, the camera angle you went for the orientation to forward was a little weird, I'd be interested to know why you picked that. I was also pretty confused by the things I was picking up, there was no particular rhyme or reason to the way I played, just kept going towards the nearest fuel container in the hopes that it'd let me keep going a bit further. I thought this was very cool. I did manage to find my way home too! The breadcrumbs/footprints I left from previous attempts was my guide and gave me a feeling of...progress. The art is unique and the music creates a certain ambiance that was appealing. I guess one has to be in the right frame of mind to enjoy any game in any genre at any given time. Mine happened to be after a stressful day at work and this definitely soothed the hell out of me. I had a goal here and I achieved it and it left me in a happy place. Thanks for making this. @Pomb Thanks for playing! Mistakes were definitely made with the camera and player movement. Thanks for the feedback. @Stygian65 Thanks for trying it out! we would have definitely added more/different sounds if time permitted, we just didn't get to that stage. @vfqd Thank you. We definitely wanted players to have a choice of their pickups. I don't think that comes through until the player 'restarts,' graves start appearing and you have more choices. @konman Thanks for this comment! I am glad you were able to look pass the flaws of the game and enjoy the experience! Even though the camera was frustrating at first it actually added something to the game for me. You are trying to find home and the music kind of gives that feeling that its difficult and quite a search to get there. The camera adds to that feeling the music is giving, at least it does for me. Great game! The audio, visuals and mechanics are as one. Which is always tricky to merge, so well done team! Awesome experience and was really happy when I finally made it home. Love the sound design and that the sound tracks gets added as you pickup the boxes. Art design is really pretty. Thanks so much! We are glad you all enjoyed it! 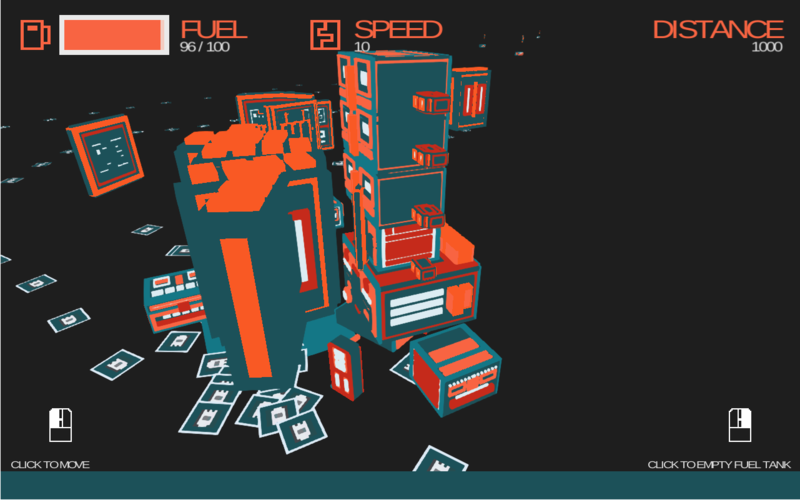 I really liked the colours, and the game GIFs really well! In particular, I like the idea of being able to build your own tower as a way of potentially personalising your experience, and I'd love to see what you'd do with an environment that isn't black. I found the camera angle being at 45 degrees to your movement direction rather frustrating. I understood that I was walking home, and I realised after a while that different blocks would give me more fuel or increase/decrease my speed, but I didn't really understand what happened when I was sent back to the start. I could see the path(s) I'd taken before, but the previous blocks that I'd picked up seemed to be unavailable, and when I restarted sometimes my speed would have changed. I never did figure out why (though I'll go back through the thread after posting to see if it was explained). I liked how there were layers of variation in the music as I continued to play. I found the game mechanically a bit flat; post-jam I'd like to see some variety in what I can do as the game progresses, whether there's an environment to marvel at, or obstacles to navigate around. There's a natural increase in tension as your fuel gauge empties, but I don't think that's quite enough yet. Congrats on a great job overall! @Elyaradine Thanks for playing! I'm not sure if you noticed but the spots where you ran out of fuel have graves that spawn objects so that you can kind of 'build' a path to home. We definitely wont make that camera mistake again. We just changed the camera so many times and forgot to change it back. That's the frustrating thing about staring at the game for so long, you just get used to it and the issues just blend in. We haven't really thought about expanding on the game but thanks for the suggestions!